This spicy curry laced with onions and coconut, the Chicken Chettinad gravy, is one of the finest and most authentic chicken curry recipe that I have made. You can make this curry with items available in any Indian Kitchen and I am sure this Chicken Chettinad recipe will be one that you will make for all important occasions. If you like less spicy curries, use dried Kashmiri red chilies and remove seeds from them. You will get the colour and flavour without the heat of chilies in the curry. In 1 Tbsp oil fry cumin seeds, coriander seeds, fennel seeds, whole cloves, cardamoms,whole red chilies, peppercorns, cinnamon for a few seconds. Add chopped ginger and garlic and fry some more. After the ginger garlic get lightly fried, add poppy seeds and fresh coconut. Fry for about a minute on low flame and add 1/4 cup of warm water to soften the masalas. Allow the masalas to cool and grind it to a fine paste. Heat the remaining oil and fry chopped onions. After the onions get well browned, add turmeric, red chili powder, half the curry leaves and the masala paste. Fry everything on low till oil separates. Keep sprinkling water as you fry the masala, this helps in blending the flavors and making the curry delightfully fragrant. After the masala is well fried, add chicken and chopped tomatoes. You won't be required to add water if you add tomatoes at this stage and the chicken will cook in the oil and tomatoes. If you do require to add water you can, but remember to add warm water. Add salt and allow chicken to cook completely on low flame. After the chicken is cooked through, turn off the heat and add lemon juice and the remaining curry leaves. Serve hot garnished with the a few curry leaves. 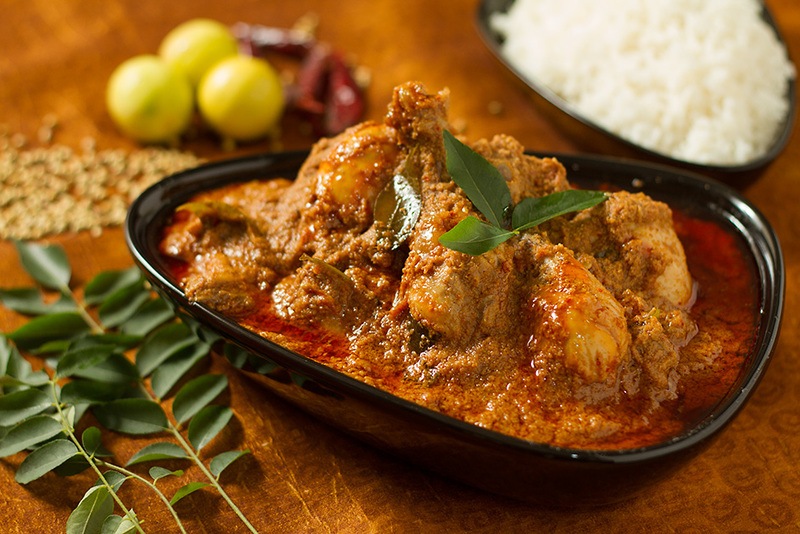 While Chicken Chettinad is typically served with steamed rice, it also tastes good with rotis. You can also serve it with dosa, or neer dosa.